Pastoral Care is an integral part of Emory Saint Joseph's Hospital, serving individuals of all faith traditions as well as persons who do not profess a religious faith. A chaplain is available on site 24 hours a day, seven days per week to provide spiritual, religious and emotional support for patients and their families. Emory Saint Joseph's Pastoral Care Department hosted an interfaith Memorial Service to celebrate the lives of patients who passed away at the hospital during the past six months. Families and friends of these patients were invited to the evening of remembrance in the Emory Saint Joseph's chapel. The hospital has hosted a Memorial Service for more than two decades. 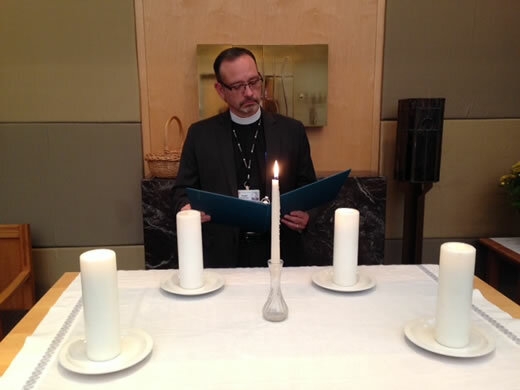 During the service, Father Miguel Grave de Peralta, Director of Pastoral Care, presented a special Reflection. The service also included a blend of sacred scripture, music and poetry presented by staff chaplains Georgia Newman and Greg Pocock; Clinical Pastoral Education Supervisory Student Rosalynn Curry; and Rabbi Judith Beiner, Community Outreach Chaplain of Jewish Family and Career Services. For many, this service is the first time family members have returned to the hospital after the death of their loved one, and confronting the emotions associated with the death can be very challenging, says Newman. Sister Margaret McAnoy, Emory Saint Joseph's Mercy Mission Representative, conducted the candle lighting portion of the ceremony. She lit four candles representing grief, memories, courage and love, and then followed by reading aloud the names of deceased patients. Each family present at the service was presented with a memorial candle to light in their home, as a remembrance of their loved one. "Our staff works with the nursing teams to help facilitate what is meaningful to the patient and their family," said Newman. "The type of support needed varies from family to family, and can include Father Miguel administering Catholic Sacraments at a patient's request or a chaplain reading scripture or poetry, or delivering a prayer at the bedside," she added.